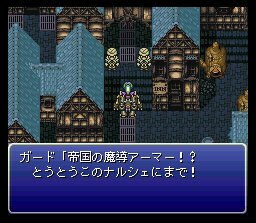 RPGClassics.com - FF6 Walkthrough v2 - Now With Twice the Goat Cheese! �2) Narshe - Figaro C.
The Description of the event will go here. It will probably be a couple of lines long, and most will include a picture. In this space will be more text, describing the event and some of my lame humor (actually lots of it), but not ruining the plot (actually, I'll be ruining the plot many more times than once :). If a boss is in the area, it will be in a separate field, as demonstrated below. 4) To South Figaro and Beyond! 7c) The Final Scenario: Is Shadow Black? 9) Why the Hell is that Castle Moving? 10) I Love This Place! Really! 16a) Theee Empire Shull Nevah Perrrrish! 17) Was Ted Woolsey a Foreigner Fan? Note on World of Ruin Walkthrough: The world of Ruin is, for the most part, non-linear. There are only a few parts of the walkthrough which are mandatory and that you must do. The rest of the parts are optional, and need only be done for completeness. Refer to the key below for more information. (D) = Dragon in this section.